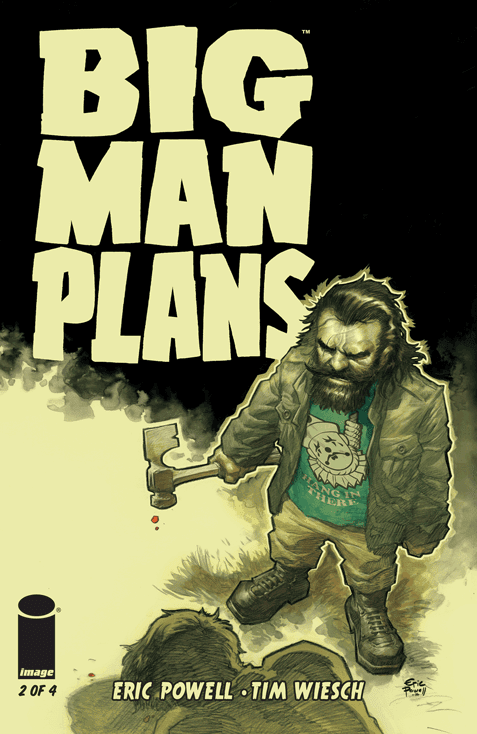 Big Man Plans #2 by Eric Powell and Tim Wiesch continues Big Man's bloody trail of vengeance and this time he may have bitten off more than he can chew. He remains undaunted though as he seeks out every scumbag that did him wrong. It's a violent revenge fantasy with the baddest little m-effer you've ever seen. Powell and Wiesch have conjured up a brutal story of payback that really shines mostly because of their leading man. The dwarf is not your typical protagonist outside of fantasy comics, but that's what makes Big Man Plans so unique and compelling. Big Man really is a metaphor for the underdog in all us. If you've ever been bullied, underestimated, disparaged, overlooked, passed over, ridiculed, abused or beaten then you can relate to Big Man on some level. Sure, we may not have knee-capped a guy with a drywall hammer but we may have thought about it. It's this fundamental desire to see justice served whatever way possible to those who put us down. It's not just Big Man's revenge fantasy but ours as well. Big Man's motivation and drive harken back to the things his dad used to tell him. He told him that life is not fair and others will put you down to make themselves feel superior. Don't let yourself be pushed without pushing back. Never give up. And he takes it to heart even in the most difficult situations. So much so that when things go wrong and he basically becomes a human pinata his will is not shattered. Powell's artistic style is pulpy and noirish in its approach. It's a wonderful exploitation film in print with unflinching violence and action with panels that are gratuitous but riveting all at the same time. You can't take your eyes off Big Man especially. Big Man Plans is a gem of a miniseries that doesn't pull any punches and has you rooting for the pissed off dwarf with the drywall hammer. Big Man, by knee-capping a guy with a drywall hatchet, begins his bloody road of revenge as more clues to his mysterious motivations are revealed.